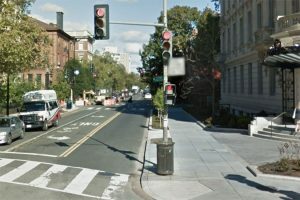 Two men were stabbed and another man was punched during a “club-related” fight in Dupont Circle over the weekend, police said. The violent confrontation happened on the 1400 block of 18th Street NW about 3 a.m. Sunday. The victims and three other people were walking just east of the Dupont Circle NW traffic circle when two men approached the group and started arguing with them, according to authorities. The group eventually walked away from the two men. But the men weren’t done with them yet. The two men, now armed with knives, came up to the group again. The duo then stabbed two men in the group. One of the victims ended up with lacerations above his right ear. The other victim received a cut to his lower back and a puncture wound to his left shoulder. A third victim was hit in the face, but wasn’t injured. The suspects ran away soon after. The two stabbing victims were treated on the scene and declined further medical attention. Police haven’t released detailed descriptions of the suspects.